In October Spids Nøgenhat will release their second studio album entitled Kommer Med Fred (roughly translated to We Come In Peace). The first single from the album is called “Lolland Falster”, which is a homage to the southern parts of Denmark, and is due out September 9th. 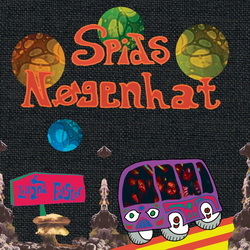 Spids Nøgenhat (which translates to the magic mushroom Liberty Cap) was originally formed as a side-project in 1998 by Henrik “Hobitten” Klitstrøm, Morten “Aron” Larsen and Uffe “Aramis” Lorenzen (Lorenzo Woodrose) who at the time all were part of the Copenhagen based band On Trial. A band that since has led to numerous offshoots like Baby Woodrose, Ghost Rocket, Dragontears, Black Beacon Orchestra, Aron and lately Blind Owl & Good Spirits. Spids Nøgenhat was inspired by Danish acid rock bands like Alrune Rod, Røde Mor and Furekåben and played a few shows in the early years as an accustic guitar trio. In 2001 they released their debut album En Mærkelig Kop Te (A Strange Cup of Tea) on Orpheus Records that did not receive much attention at the time but since then has grown into a serious cult album with several reprints on vinyl. The band resurrected in 2009 after public demand now including Anders “Moody Guru” Skjødt and Anders “Fuzz Daddy” Grøn, who both were in the original line-up of Baby Woodrose along with Lorenzo, and Sebastian “Zeppo” Bülow who makes the great visuals that always give a special vibe to the Spids Nøgenhat shows. A legendary concert at Roskilde Festival in 2011 later turned into the live album De Sidste Her På Jorden from 2012.